Dylan Childress and his buddies are on the motorcycle trip of a lifetime. But the sight of a woman in distress stops them in their tracks. And while the guys are checking out her car, she and Dylan are checking out one another. In one brief moment, the world tilts on its axis and any previous plans Katie and Dylan might have had for their futures are left at the side of the road. WELCOME BACK TO THE RIVER. I read Bring Me Home for Christmas over the holiday's and loved it. I wanted more. There are several books in the Virgin River series and I intend to enjoy every one. I enjoy the predictability of romance novels. I really do. Don't be fooled though, thinking that you'll know the whole story from the beginning. You won't. Redwood Bend promises several surprises to keep you interested. I found the characters well rounded and not as mushy gushy as some of the historical romance novels. I like this. I like my characters real. They had real issues and problems. The setting is what is truly beautiful about this story.Virgin River is a place I've actually dreamt about. I'd love to live back in the country. The people and the place make this story. I enjoyed the romance of it all. There wasn't as strong of a love story as you might think. It was the center of the story no doubt, but there was so much else going on as well. I actually wanted more of those tender moments between Katie and Dylan. But, I love romance! If you are wanting to give romance novels a try, then I would definitely recommend the Virgin River series by Robyn Carr. I'm loving them! Thanks for stopping by my blog yesterday! LOVE the Virgin River series! I can hardly wait for this book to come out. Great review by the way. That's a great review, this novel looks great - I really love your blog, it's lovely! @NTM I've only read a few of the virgin River series, but each one I have loved. There are like 18 books! I'm going to enjoy every one. 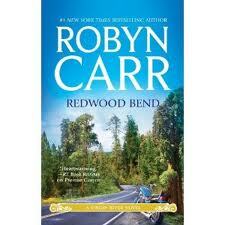 I love Robyn Carr and the way she writes, I've only read a few Virgin River series, but they're so good!